enough to get her own feature. So the closest we can come to pinpointing her debut is, she was probably first seen some time during the 1930s. Iodine was the only child of Henry Tremblechin, a Caspar Milquetoast type whom Hatlo used as a recurring victim. She was one of those mischievous little girls, along the lines of Marge Buell's Little Lulu; but since her dad's main function was to have funny but unpleasant things happen to him and her main function was to cause them, Iodine was worse. 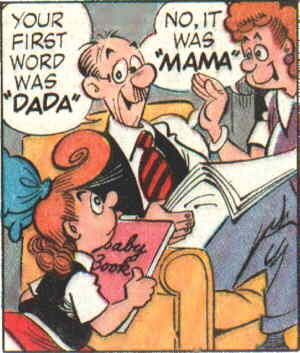 In fact, the cartoonist later described her as "The embodiment of all the brats I knew". Lulu eventally mellowed out, but not Iodine. Iodine started as nothing more than a source of frustration for Henry, alongside his nagging wife, his domineering boss and the world in general. But as awful as she was, Hatlo made the readers like her — so much that on July 4, 1943, King Features Syndicate made her the star of a Sunday-only strip. A few years later, Dell Comics followed suit — they published a Little Iodine comic book from 1949-62, 56 issues in all. She also starred in a live-action feature film, released by United Artists on October 20, 1946. Henry (whose last name was truncated to "Tremble") was played by Hobart Cavanaugh, Mrs. Tremble by Irene Ryan, and Iodine herself by Jo Ann Marlowe. Marlowe, a child actress who left the business not long after puberty, has another toon connection — she once played Joe Palooka's kid sister. The actor who played her dad, too, had an earlier toon connection — Hobard Cavanaugh had been Harold Teen's dad in 1934. In the movie version, Iodine actually did mellow out at the end, which may explain why only one film was made. In all her comics venues, Little Iodine was signed by Hatlo and produced under his supervision, in his old-fashioned bigfoot style. His main assistant/ghost was Bob Dunn, who had previously worked for Rube Goldberg. Dunn took over in 1963, when Hatlo died. Others who worked on it include Al Scaduto (who inherited the operation from Dunn), Bill Yates (Redeye, Professor Phumble) and Hy Eisman (Popeye, Katzenjammer Kids). All maintained the Hatlo style, but with Hatlo gone, it was no longer the same. And the style itself looked more dated every year. The Little Iodine strip ended in 1986. They'll Do It Every Time lasted until 2008 (over Scaduto's signature), but Iodine hadn't been seen there in years. Text ©2002-10 Donald D. Markstein. Art © Bagdassarian.